PowerSchool is an education technology platform, trusted by K-12 institutions in more than 70 countries. This platform offers intuitive yet easy-to-use online tools which can help you organize student databases, streamline registrations, and even tackle special education management. 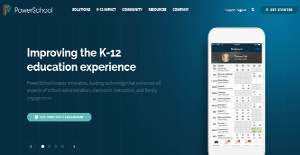 It provides robust capabilities and APIs that allow educators, administrators, parents and students to effectively manage school processes and student data and connect the diverse education technologies used in classrooms, schools and districts. Its interface also has a configurable architecture with APIs that allow customers to integrate their system with some of the best third-party applications on the market. PowerSchool offers a variety of solutions for online education. One of them is PowerSchool SIS, touted as the leader in SIS across the world. It offers a clean, intuitive interface and powerful tools and resources to help administrators and teachers manage grades, students and classrooms. It also seamlessly manages the day-to-day operations for student data management in any size school or district. Moreover it has a highly customizable interface that let it extend SIS functions using independent software vendor (ISV) applications. PowerSchool also offers Analytics which is a longitudinal data system designed to help educators make data-driven decisions about instruction, curriculum, and professional development. Visual illustrations and comparative analysis of long-term academic performance, state data, attendance data, and intervention data provide insights to inform decisions. Educators can address areas that need additional support for both students and teachers, and helps identify areas of weakness at the school, district, or classroom level. Another component is Learning which lets educators spend more time teaching and less time managing assignments, tracking down homework, and grading papers. This cloud-based learning management and classroom collaboration solution empowers teachers with real-time student interaction inside and outside the classroom, bringing in more social and collaborative learning. Teachers can quickly create and deliver rich, engaging content with embedded lessons, easily receive digital files from students, and electronically provide comments, feedback, and grades. It is crucial to realize that hardly any service in the Learning Management System - LMS category is going to be a perfect solution that can meet all the requirements of various business types, sizes and industries. It may be a good idea to read a few PowerSchool reviews first as specific software can excel only in a very narrow group of applications or be prepared with a very specific industry in mind. Others may work with an idea of being simple and intuitive and therefore lack complex elements needed by more experienced users. There are also solutions that cater to a large group of customers and give you a rich feature toolbox, however this usually comes at a more significant price of such a service. Be certain that you're aware of your needs so that you get a service that provides all the features you look for. How Much Does PowerSchool Cost? PowerSchool’s SMB and enterprise pricing information is available only upon request. Contact the company for more details, and ask for your quote. We realize that when you make a decision to buy Learning Management System - LMS it’s important not only to see how experts evaluate it in their reviews, but also to find out if the real people and companies that buy it are actually satisfied with the product. That’s why we’ve created our behavior-based Customer Satisfaction Algorithm™ that gathers customer reviews, comments and PowerSchool reviews across a wide range of social media sites. The data is then presented in an easy to digest form showing how many people had positive and negative experience with PowerSchool. With that information at hand you should be equipped to make an informed buying decision that you won’t regret. What are PowerSchool pricing details? What integrations are available for PowerSchool? If you need more information about PowerSchool or you simply have a question let us know what you need and we’ll forward your request directly to the vendor.